A U.S. Army Ranger from New Hampshire was killed in a training accident this week at Fort Stewart in Georgia. Cpl. Andrew A. Aimesbury, 21, of Strafford, New Hampshire, was seriously wounded during a live fire exercise and taken by medical helicopter to the closest treatment facility, where he died, the Army said. Aimesbury was assigned to Company D, 1st Battalion, 75th Ranger Regiment, at Hunter Army Airfield in Georgia as a Ranger team leader. He served one tour in Afghanistan. He was born in Manchester, New Hampshire, and graduated from Dover High School. "Cpl. Andrew Aimesbury was an exceptional Ranger leader and an extraordinary man," said Col. Brandon Tegtmeier, commander of 1st Battalion, 75th Ranger Regiment. "He was universally liked throughout the battalion for his competence as a warrior and his caring nature. This tragic event has affected us all and our hearts break for his family. Corporal Aimesbury will always be a member of 1st Ranger Battalion and his memory will make all of us better men." Aimesbury is survived by his parents, Carl and Karen Aimesbury, and his sister, Abigail, all of Somersworth, New Hampshire. 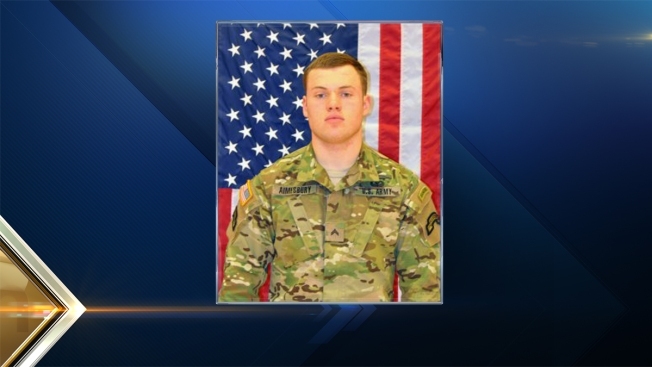 "Corporal Andrew Aimesbury was a well-decorated soldier lauded by his unit as an exceptional Ranger, strong leader and extraordinary young man," New Hampshire Gov. Maggie Hassan said. "He bravely served our country in Afghanistan, and thanks to his unyielding commitment to protecting his fellow citizens, our country is safer and our freedom is stronger." U.S. Sen. Kelly Ayotte also issued a statement lauding Aimesbury's courage and honor. "His death is a heartbreaking loss for New Hampshire and our country," she said.